It has really been a pleasure to work with Emory and the FabCab team on our project. We’ve had many challenges because we must rebuild on our existing footprint and ensure that all County and State requirements regarding building in a shoreline environment are met. Emory had to go back to the drawing board many times to revise our plans and each time he turned them around quickly and with creative solutions to every potential problem we encountered. His communication and responsiveness are superb and he has provided us with excellent guidance and advice throughout this process. We give Emory and his team our highest and most enthusiastic recommendation! FabCab has enthusiastically embraced my vision in a very professional manner. I appreciate the interactive approach, where my ideas are treated respectfully, while at the same time, the architects provide professionalism, leadership, creativity and expertise. I appreciate that they recognize and respond to my need for staying within a budget. They are a pleasure to work with! 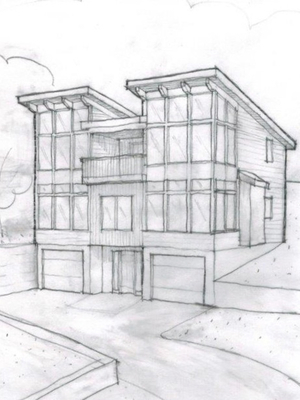 Our dream design included a small footprint, open floor plan, high ceilings, windows galore, and environmental kindness overall. FabCab design provided all that AND smart and genuine people to work with throughout the process. Nothing but good. I just wanted to update you and let you know that we have moved in to our wonderful new house and it absolutely exceeds our expectations! We cannot believe how much room and storage we have – it’s just unbelievable and we believe you and your colleagues were true magicians to give us this much more space even though the house was built on the exact same footprint! The fact that we have two spacious bedrooms (each with a private bath), a walk-in closet and a laundry area where formerly there was just one “room” is totally amazing. Thanks for your great work and vision on our home. It’s really been a pleasure working with you! The team at FabCab consists of a group of young and very talented professionals who all work to design and deliver a beautiful, green, timber frame home. The results are stunning! FabCab worked with us from start to finish, offering custom floor plan design expertise, interior design consultation, and even recommendations for the Contractor, Jim Hall, that we ended up choosing. The “package” we purchased made decisions so much easier than other traditional construction, where the universe of choices can be paralyzing. Along the way we were given suggestions about appliances, carpet, flooring, etc. that were compatible with the style we had chosen. Although we were free to choose totally different interior components, we stayed mostly within the recommendations because they were great options, and because it helped us keep within our budget. We ended up with a 1440 sq. ft. home that seems larger than our previous 2100 sq. ft. home, and we are thrilled with the finished product. The aesthetics of FabCab with its really modern look and exposed timberframe construction really resonated with us. My husband and I both loved it immediately. We were suddenly very excited about the possibility of having found an affordable and beautiful home for our property. Evermore thanks to Emory and Chelsea and all the others who are literally making this long-standing dream of ours come to fruition. FabCab: Love at first sight! We bought this FabCab at the Seattle Home Show after one walk through! The combination of open design, beautiful craftsmanship, spacious atmosphere, and abundance of light from the wall of windows was irresistible. We knew that it would be the perfect ready-to-go cabin for our property in eastern Washington State. My first encounter with FabCab was at the Home Show in Seattle. It was instantly obvious that they had captured a stunning design, top quality structural components, Universal Design, and Built Green components in a complete package. After examining every nook and cranny, I spent a long time talking to the representatives of FabCab. Each person I talked to reflected the vision and professionalism represented in the FabCab home on display. It was a complete package. It wasn’t long before I was building a waterfront FabCab home for a Green Realtor on Camano Island. It was then that my original impressions of the company were verified. The attention to detail in the plans was extraordinary. As site-specific issues came up, they were quickly resolved. When the homeowners wanted advice on interior and exterior finishes, FabCab was there to help them complete their vision. The home was constructed quickly and is now getting the finishing touches. It is stunning. 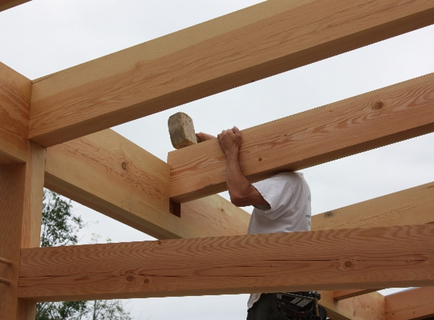 I have been building architecturally designed custom homes on Camano Island and in the surrounding area for 23 years. It is not an exaggeration to say that my experience with this FabCab project has been one of my favorites. 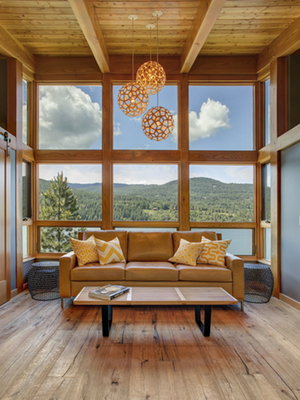 In 2012 our client fell in love with a FabCab model for their Lake Pend Oreille property. We had never worked with the firm before and although geographically distant, we found them to be very open, helpful and accommodating to our client’s desires and our challenging build site. From the first meeting to post completion everyone at FabCab was quick to respond to questions and help when necessary to keep the project running smoothly. Our clients love their FabCab and we truly enjoyed the project. The timber frame and SIPs went together amazingly well. Working with FabCab saved me at least a year on the construction process. It was a real pleasure working with them.